Here is the history of the Rhodes Project. 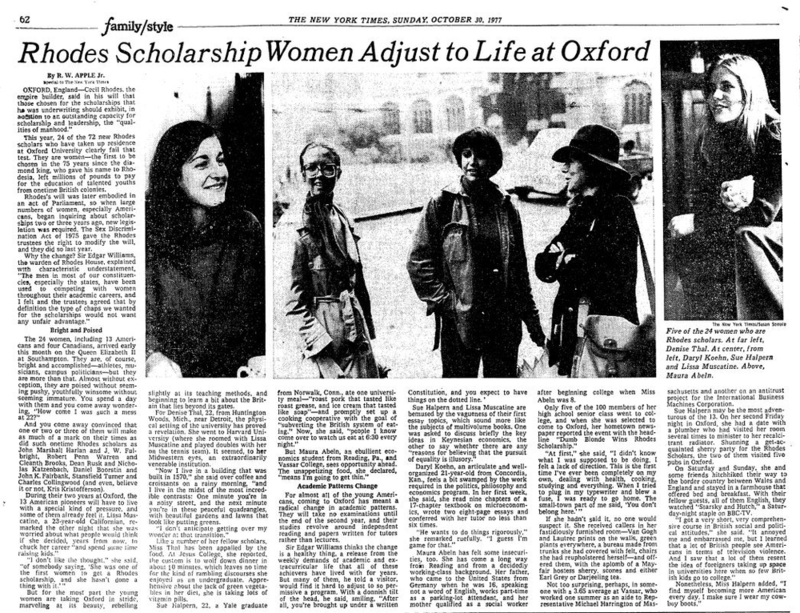 I began to think about the women Rhodes Scholars I knew, who by conventional measure should have as good a chance as anyone to achieve “success.” We were clearly able to take advantage of opportunities closed to earlier generations of women, which is real progress. But are we really free to take advantage of them to the same extent as men? And if so, do we? The accepted lore among Rhodes Scholars and commentators has been that female Scholars have not shone as brightly in their professional paths as their male peers. But is this true? Certainly I know of Rhodes women who have achieved high positions in traditionally male settings, e.g., business, law, science. But are these exceptions to the rule? And is the “rule” anyway misleading because it fails to take into account the disparity in absolute numbers (many fewer women have passed through the Scholarship program than men) and the fact that even the oldest have probably just begun to reach the pinnacles of their careers? I began to think that these questions were worthy of systematic investigation. If Rhodes women are in fact achieving as much as men, it would be sensible to lay out the evidence before the oft-repeated impression of women Scholars’ under-achievement becomes self-fulfilling. If they are not, then how are they leading their lives? And is the definition of “achievement” appropriate? It seemed that a comprehensive survey of the first generation of women Rhodes Scholars’ life choices, occupations, values and beliefs might yield surprising results. When I aired this idea, I was struck by the positive reaction from family and friends, who seem to view this cohort of women, rightly or wrongly, as a marker of the progress of women and the women’s movement over the last 30 years. As an economist, trained in statistical analysis, I had the formal tools to oversee such research. I also thought I might be able to access the network of women Rhodes Scholars to add color and substance to the bare numbers. When I canvassed them, I was met by real enthusiasm I had not anticipated. This provided me with the final encouragement to believe that the questions that were occupying me and my circle might also interest a larger group. And so, in the summer of 2004, I embarked on the Rhodes Project. It has generated some extraordinary results so far. I expect that the program of research we are conducting will continue to do so. My hope is that our findings will be useful not only to academics but to everyone interested in women’s progress and the complex but absorbing problems of achieving real equality. In that sense, I hope the Rhodes Project will attract new people and new ideas to an important and continuing conversation.